Bluebells are popular, even in the rain. Despite a drizzle that continued all morning, about 200 people took nature walks, examined frogs and turtles, and explored skins and skeletons of local mammals at Merrimac Farm Wildlife Management Area at the second annual Bluebell Festival on Saturday, April 11. The Prince William Art Society’s show was a major new addition to the event this year. In addition to local artists, Gail McDowell brought her paintings from California. Her father and mother, Colonel Dean and Mary McDowell, had sought for their 300-acre farm to be conserved. A five year effort by the Prince William Conservation Alliance, together with family persistence, led to purchase of the property in January, 2008 by a partnership of the Alliance, the Marine Corps, and the Virginia Department of Game and Inland Fisheries. The Merrimac Farm Wildlife Management Area is managed by the state agency, and was officially dedicated last year. In the last year, the Stone House has been rehabilitated by volunteers and the wildlife agency, and now provides shelter for visitor contacts and exhibits. On Saturday, you could see the team that acquired the property was still working together. During the rain, the tents erected by Quantico Marine Corps Base were popular gathering places. State biologists told tales about bears, toads, and other wildlife, while encouraging visitors to discover how teeth and bones reveal the lifestyles of the fast and furry creatures. 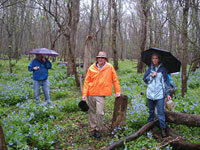 Interpretive tours led by the Prince William Conservation Alliance included a short ½ mile walk to the center of the bluebell patch, which stretches for a mile along Cedar Run. Longer walks included tours of birding hot-spots and deer/turkey upland habitat, as well as the bluebells. Many thanks to the organizations and agencies who helped create a great event: Bull Run Mountain Conservancy, Prince William Art Society, Prince William Forest Park, Prince William Wildflower Society, and the U.S. Fish and Wildlife Service. The third annual festival is scheduled for Sunday, April 11, 2009. Throughout the year, other public programs are scheduled at the Merrimac Farm Wildlife Management Area. For more details, check our calendar here... Click here to view photos from previous events.